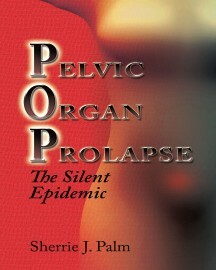 Sherrie Palm’s book about pelvic organ prolapse fills an unfortunate void in women’s health awareness. Pelvic Organ Prolapse (POP) is a little talked about women’s health condition that is estimated to impact half of the female population. There are more than 300,000 surgeries for POP annually in the US and millions of women in every country suffer in silence. Due to various causes such as childbirth, menopause, genetics, chronic constipation or coughing, hysterectomy, aggressive athletic activity, or heavy lifting, a woman’s pelvic organs can drop into the vaginal canal and push outside of the body. Women may experience incontinence, constipation, painful intimacy, pain or pressure, and tissue bulge. POP has been on medical record for over 4000 years, but has received little press or public acknowledgement. Sherrie Palm dissects the condition and writes about her own personal experiences in Pelvic Organ Prolapse: The Silent Epidemic. Palm was unfamiliar with POP until she was diagnosed and needed surgery; discovery upon diagnosis is common with pelvic organ prolapse. This book explores the subject from all angles, providing the information women need to recognize the symptoms of POP and to become advocates for their own health.